Mistakes happen. It is a common phrase used to absolve oneself from guilt. In the judicial system this phrase means nothing. Arrests and convictions stay on public record. If you have either one, then anyone can see it! This means that your reputation is tarnished. It could affect potential employment,volunteer work,and in this age of internet dating, it possibly could even affect a romantic interest. There are websites available where anyone can pay an incredibly small fee and view a person’s information! If you are concerned about this, expungement could be an option. You may be wondering what expungement means. It simply means that an arrest or conviction on your record is no longer available as public record. Another way to look at it, is that the information becomes sealed. The Va. code section 19.2-392.2, gives three situations that may indicate a person could expunge record in Virginia. All three situations deal with the charges being dropped or the defendant not being prosecuted, but these situations are dependent upon innocence of the defendant. Some misdemeanor crimes can be dismissed by the courts if a judge determines that instead of sentencing; community service is served, restitution be paid, or perhaps any other number of conditions be met. However the Supreme Court’s interpretation may not include these conditions as a means to make a guilty person eligible. If you think you are eligible for Virginia expungement, you may file a petition. It must state relevant facts and request removal of the police and court records relating to the charge. It also must state why the particular charge is detrimental to you. This must be filed in the court of the county or city where the case occurred. Vital information that is needed will include: date of arrest, name of the arresting agency, the specific charge to be expunged, date of the final disposition of the charge, your date of birth, and your full name at the time of the arrest. The petition also must be sent to the commonwealth attorney, and they may decide to file an objection. He or she has up to twenty one days to do so. The final step would be to attend the hearing. The best way to handle this would be to visit expungecenter.com. There is a do it yourself kit available that will walk you through the process. It is a much simpler process than trying to do it alone. Legal matters can be complicated and at times feel exhausting. However, with proper guidance and advice, a legal matter potentially can become an easier situation that doesn’t cause undue worry and stress. We do all make mistakes, but not everyone deserves a life sentence. 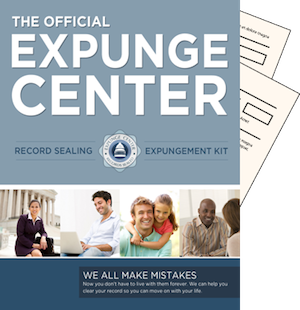 Visit expungecenter.com and breathe easier.